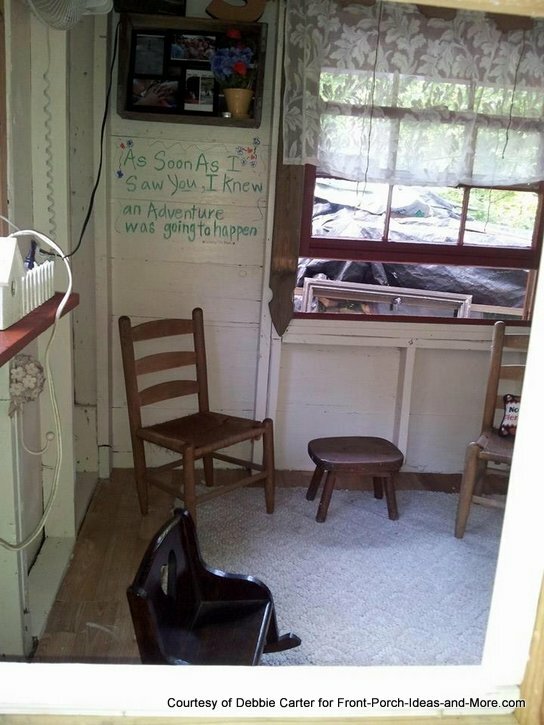 Many people will go to great lengths for their love of a porch. 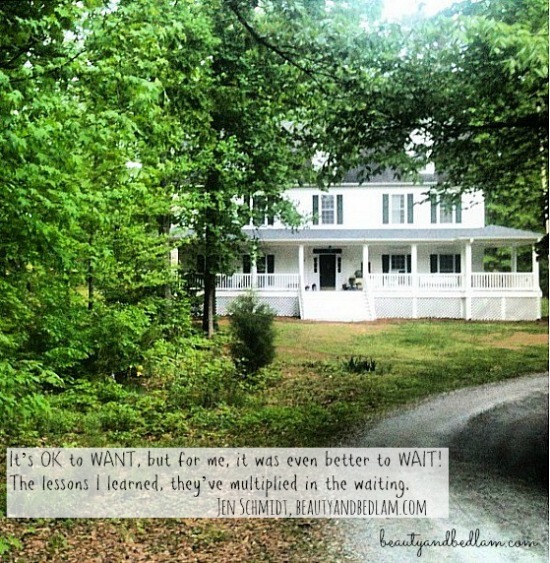 If you have ever wanted a front porch but it only felt like a dream, please read our stories. 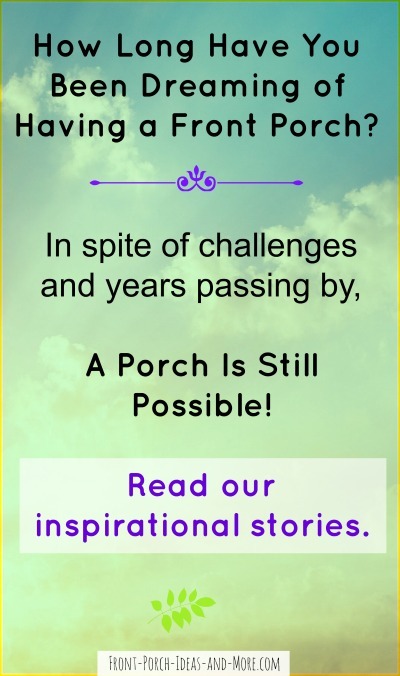 Jen and Kelly's real-life stories will resonate with any porch lover. And Sofia's playhouse is a must-see. Cute as a button little house with a sweet front porch. 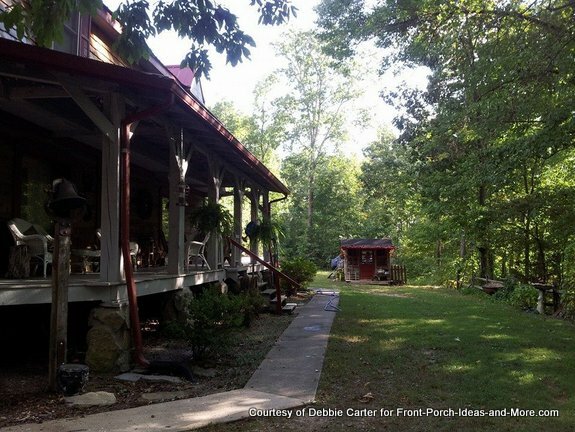 We hear from many of you that you long for a porch, you dream of a porch, you ache for a porch. 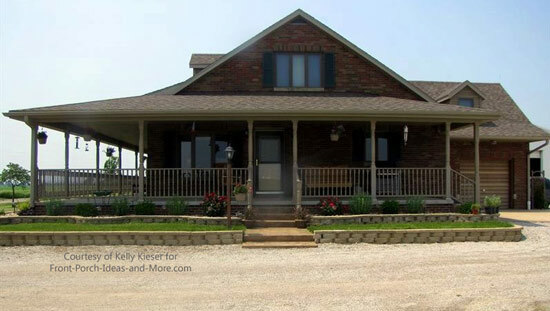 You think of the birthdays and family meals you would celebrate on the porch. You dream of moments on the porch just listening to the song of the northern cardinal high up in the oak tree or turning the pages of a favorite book. You remember catching fireflies in a jar on the porch and watching the magical sky at night from the porch swing. As Jen and Kelly will validate, sometimes dreams do come true - but not without some sacrifice and vision. Life happens on the way. Money gets scarce. Other priorities move up the ladder. Don't be discouraged though. If you keep that sweet vision near and dear to your heart and if you are willing to do what it takes, then you may find yourself sitting on your own porch someday. Porch love! Jen is the author of Balancing Beauty and Bedlam and mother to 5 children. 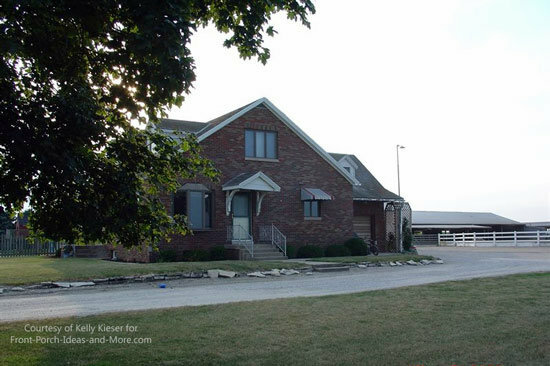 She and her husband live on 30 acres with her extended family (parents, siblings and cousins) all sharing a family homestead. 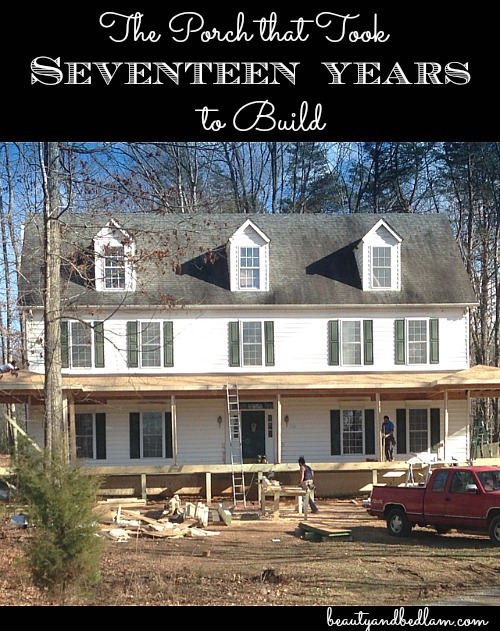 Jen and her family have quite the story about the porch that they wanted to build on their beautiful colonial style home. In fact, they selected a colonial style home plan (over 17 years ago) because they could envision a spacious southern-style porch on it. They wanted their porch to accommodate up to 60 people. Yes, 60. For years Jen held close to her heart the dream of having a spacious porch where their family and friends could gather to celebrate everyday moments and celebrate special events, too. But they were also personally convicted to saving up for it and paying cash for their porch. So over the period of ten years they saved up enough cash twice in their "front porch fund" to pay for their dream porch only to have to spend that money for other things such as daily expenses when unemployment hit their household. But Jen and her family never gave up on their wish for that porch. In spite of life's ups and downs, disillusionment and joys, they saved up a third time and actually were able to build that porch. 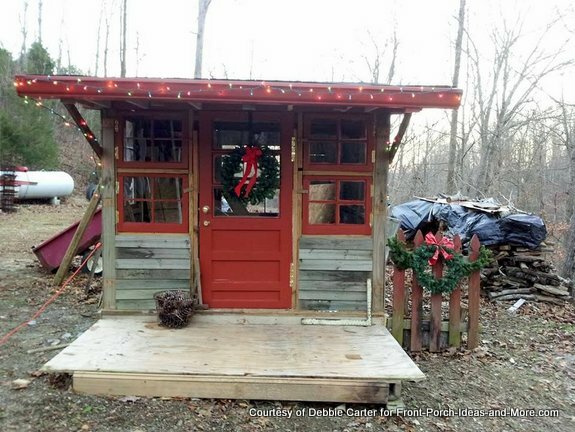 Their finished porch is amazing but not exactly what Jen had envisioned from the start. 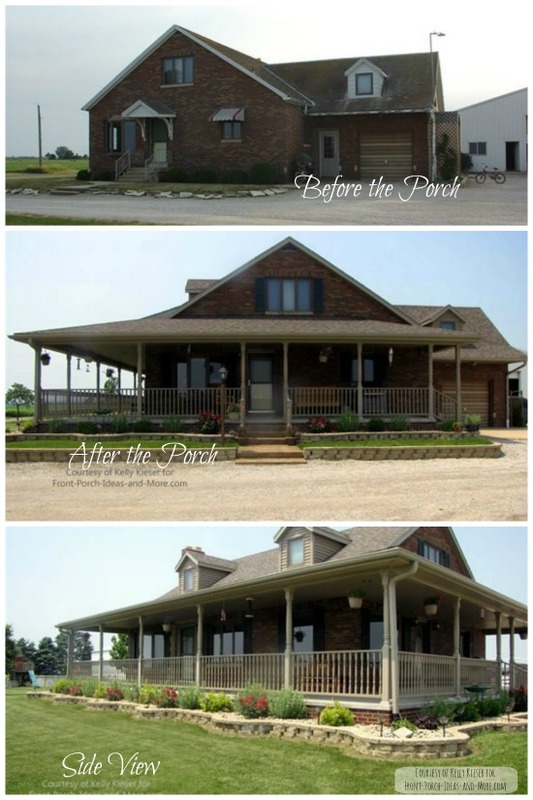 After all the years of saving up, life happening and having to save again, the price for their dream porch had risen beyond their budget. So they had the difficult task of deciding where to cut costs - a foot here and a foot there. 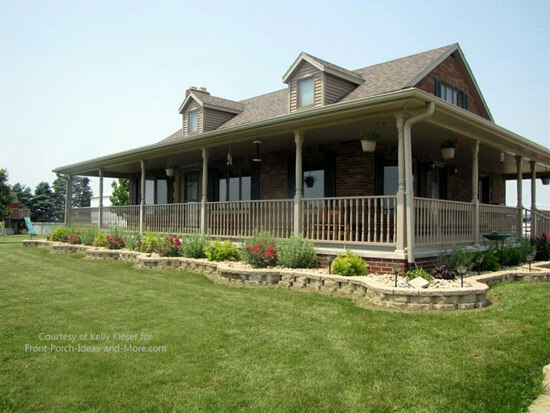 Needless to say, it's an amazing and spacious veranda-like porch that any porch lover would love to claim. 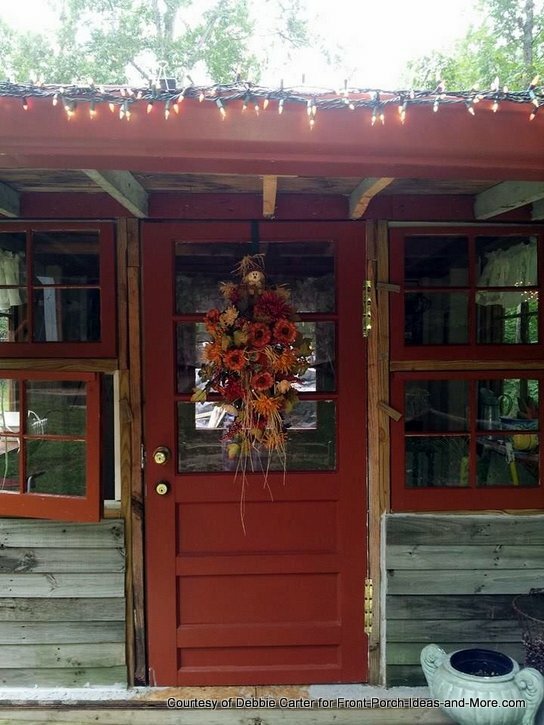 If you click over to Jen's blog, Beauty and Bedlam, you can read the full details of their memorable 17 year journey to save for this porch as well as learn more about the porch building process. 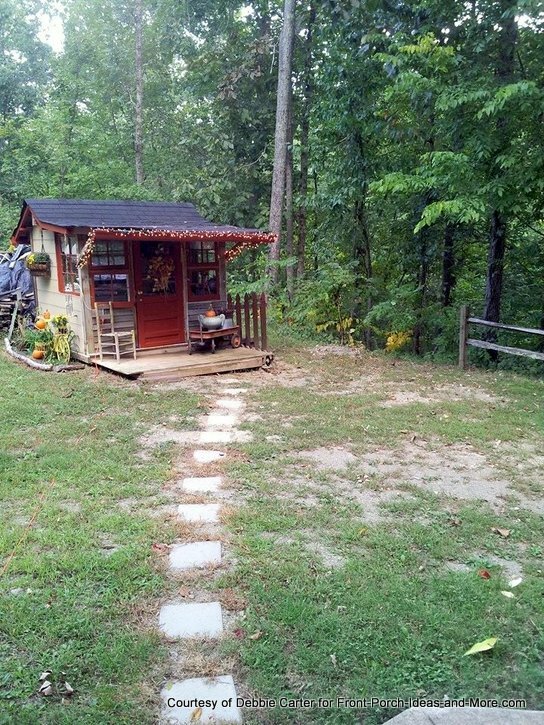 She tells not only where they "cut" costs, but also about the wonderful porch flooring they splurged on. Jen learned to be content during those years while she was waiting for her dream to be realized. We can all take a lesson from that. We are most appreciative to Jen for sharing her story with us. 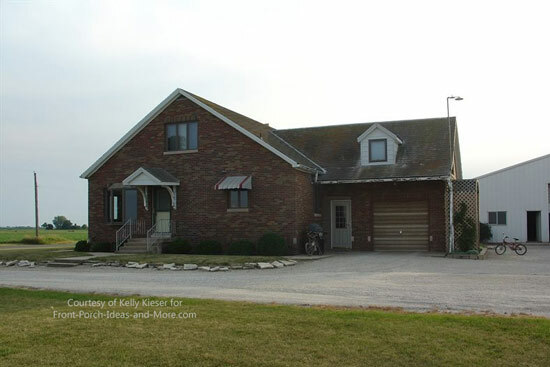 Well, to start with, the house we lived in was the house that my husband's grandparents built and lived in back in 1949. His parents then lived here and we moved here in 1994. I grew up with a small porch and really enjoyed it so I have always wanted a porch. I finally convinced my husband to get me a porch and we started working on it in 2006 and finished putting the railing up in 2010. My husband and I took pictures of a porch that is near us that we liked that we thought would resemble what our porch would look like and went from there. My husband and my sons did all of the work (except the concrete and brick work). Side view of Kelly's porch with new landscaping around the porch. After the porch was done we did the landscaping around the porch. Although it took 4 years to complete (it's hard when you do all the work yourself and are a farmer with limited time) but it was worth the wait. So many people drive by and comment on how the house has changed and how much they like it. I really enjoy sitting out on the porch watching my birds and relaxing on the porch swing. I don't know what I will do when the time comes to move. I guess he will have to build me a house with a porch or find a house that comes with one already. 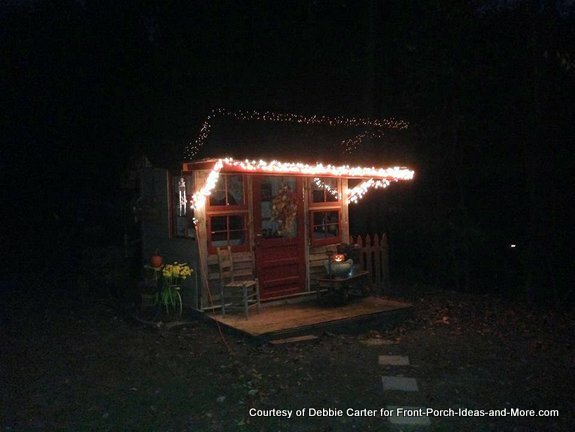 Every house needs a porch in my eyes! We thank Kelly for graciously sharing her story with us. Oh, for the love of a porch! 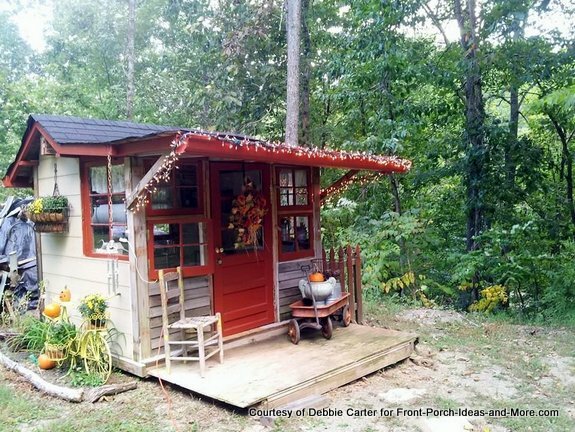 Debbie wrote us to tell about the story of the little house they built for their granddaughter. 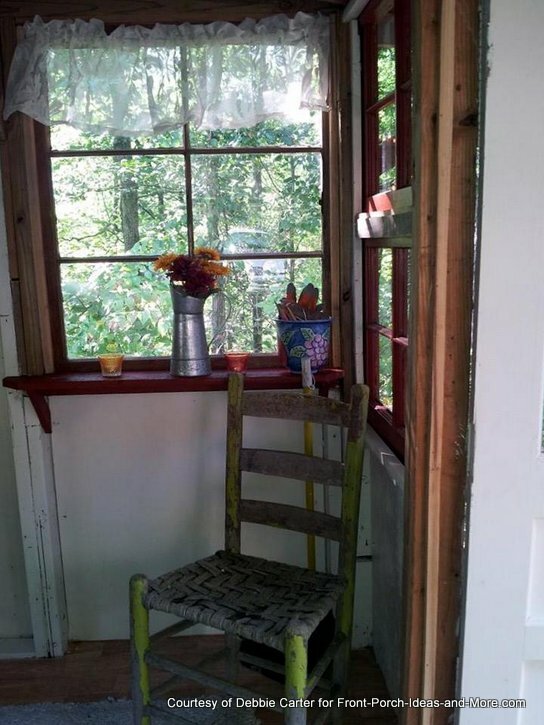 And did I mention it has a very cute porch, too? 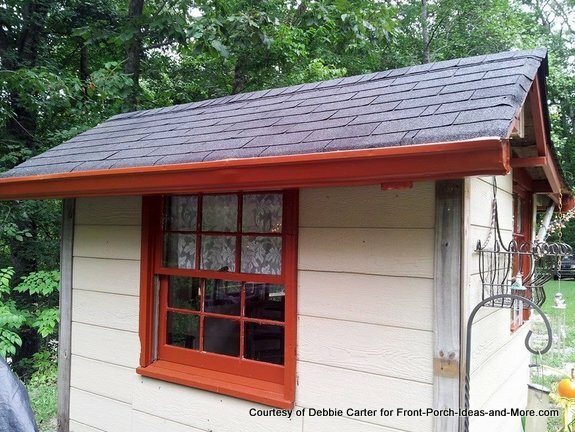 Debbie says it's a continual work in progress and she enjoys spending time working on it over the weekends. Wouldn't any child love this play house that includes a porch? Debbie and her husband are grandparents to Sofia and they built this for her. I think Sofia is quite blessed to have such loving grandparents. 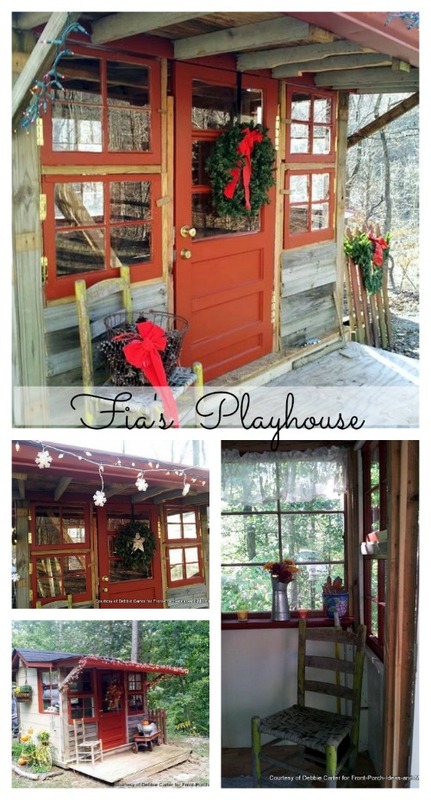 The playhouse is lovingly known as Sugar Shack, or as their granddaughter likes to say "Fia's house". 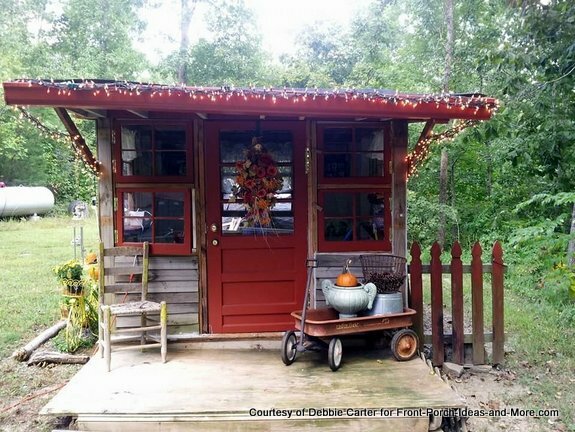 Here you can see that Debbie has it decorated for autumn. Even a little garden on the side and a planter box for mums. Look at the vintage bike and antique wagon with pumpkins and pinecones, too. 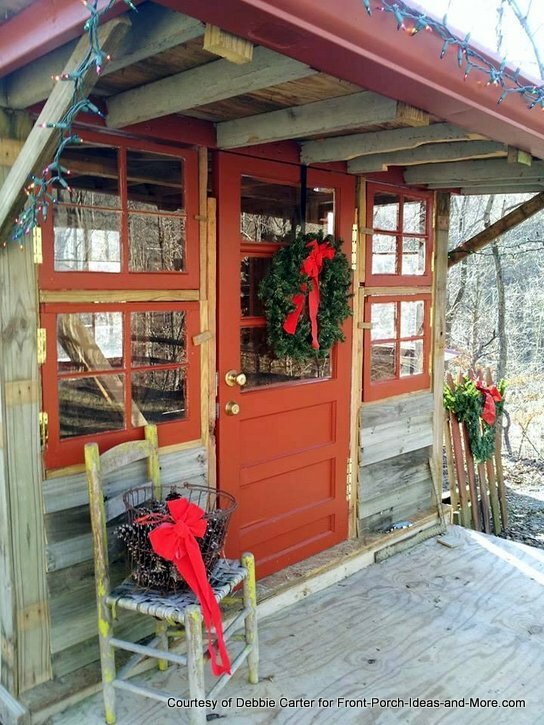 Here you see the Sugar Shack porch decorated for Christmas (last year). I like the little bit of picket fence along the side that is decorated with a Christmas wreath. Debbie says they may change the fence out to cedar to match their home's cedar fence. And she is quite excited about the decorations they will put up this year including a Christmas tree. 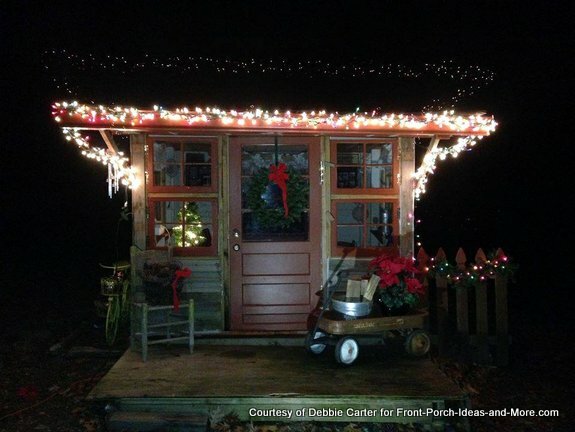 Debbie decorates the house for all seasons. I bet it's adorable in the springtime, too. For the love of a porch indeed! Wanted to show you how Fia's house is decorated for Christmas 2014. What little girl wouldn't love this? Adorable vintage wagon with poinsettias. The playhouse is near Debbie's big house. What a nice place for a little getaway - even for a big person. Debbie says she works on the playhouse in some fashion every weekend when possible. If it rains, she just sits inside it. Her husband asks if it's for her or Sofia. Debbie says it's for everyone! Here you can get a feel for the size of this little house. It is 8 feet by 10 feet. Actually like the size of a small bedroom. The wood pile is for the big house. When you stand at the front door, you can see how charming it must be inside. Debbie was so nice to include inside pictures for us, too. But first, let's take a look at the back of the playhouse. Complete with a window and cute lace curtains. A close-up of the planter on the side of the play house. 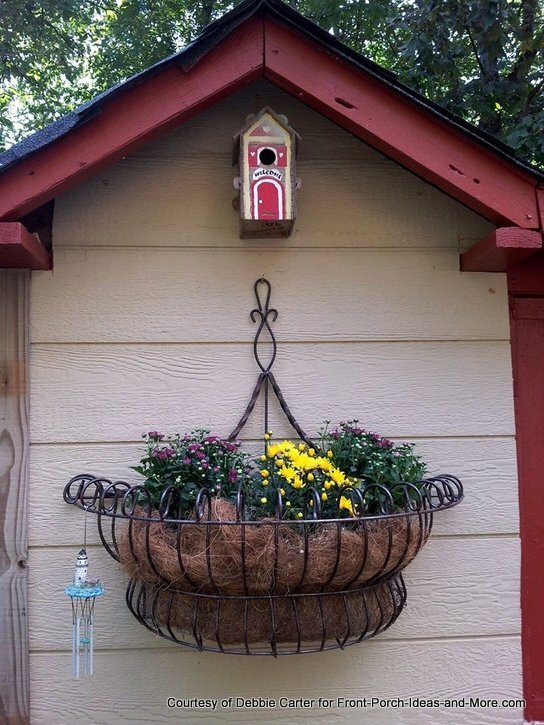 And a tiny bird house, too. Oh, and do you see that tiny windchime? I think it's a lighthouse. Now let's tour the inside. A-d-o-r-a-b-l-e is all we can say. 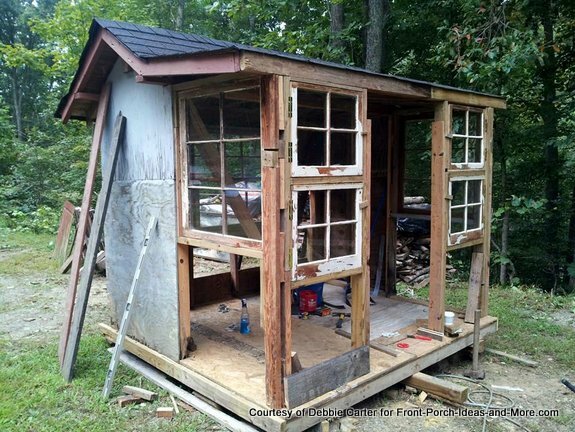 The playhouse was built from scrap materials. A true labor of love, the only newly bought parts are the piano hinges for the front windows to open out and one bundle of shingles. The largest part of the roof and a very small portion of outside walls and floor are 20 years old, originally built for their daughter when she was 8. The paver path leads to a magical place where fun memories are made for Sofia's entire family. 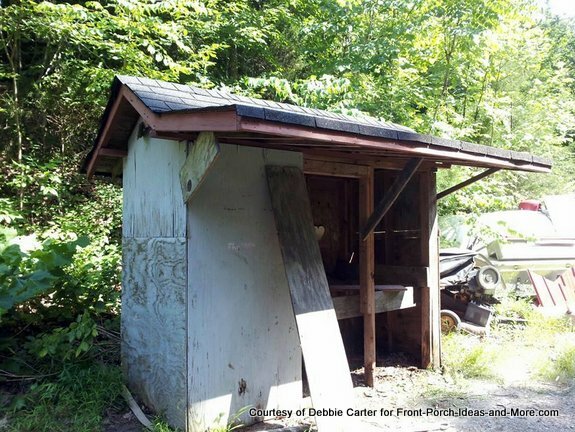 We are most appreciative that Debbie shared her story and these pictures of Sugar Shack with us. 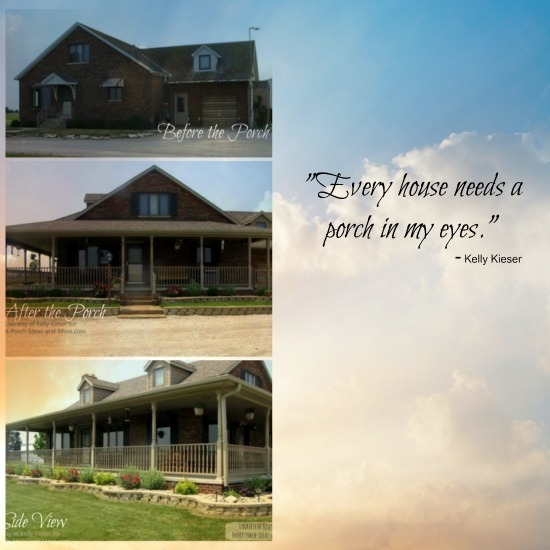 How can you make your porch dream come true?